The MLM bucket help plan is the latest help plan in MLM industry, but this plan could not create any milestones MLM business industry. 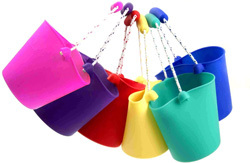 In MLM bucket help plan when recruits, new donor enters in a bucket in which there are various levels of help and the recruits just helps a previous donor and receives multiple helps from other new donors. When the new recruits complete all levels of 1st bucket and receive all the helps, he/she needs to renewal to qualify in the next higher bucket. The MLM Company who wants to start their MLM business with bucket help plan, can introduced number of buckets as per their plan and also can set their helping criteria and our expert team of consultants can assist you to improve your business plan. MLM Software India with their team ready to develop your concept into fully featured MLM Software for Bucket Help Plan.